What Was Stock Like? Only one in the store...I've yet to see him locally outside of the one in my hand. Slogan: "I've Got My Eye On You!" Eye-Brawl was easily my most anticipated Giant past the initial release...the only one I would say might have given him in a run-for-the-money in that department is Crusher. Eye-Brawl has a great overall look and perhaps one of the best back stories of any Skylander. A truly unique story and build lead me to anticipate some great things. While his light-up feature isn't as detailed, it is about the only thing they could do with the pose and is executed quite nicely. His stance is authoritative and he looks to be built to battle. I have heard from several other Portal Masters that Eye-Brawl is a bit one-sided on the upgrade path, but I am still excited to check it out for myself as I have "high" hopes for him. We will "see" how he plays out. What Was Stock Like? Last one in the store. I've only seen the one I have in my hand locally. What Lights Up? Both armor plates on the wrist in a nice, deep blue. Slogan: "Hail to the Whale!" I have to say, once I saw Thumpback in person and then especially after opening him up...I am VERY impressed. Most of the Giants have just come in a standard pose if you will...they don't really have anything "extra" like you see with some of the regular Skylanders. Crusher has his hammer and Thumpback was posed with his "Ultimate Anchor." The anchor and adjoining chain really add something to the table aesthetically. In addition to the fact he is an "accessorized" Giant, Thumpback is also detailed very, very well. To further accent his looks, the light-up effect was well done on two fronts. First, the blue is very nice. Second, the fact it is spread from end-to-end is much appreciated. Those two together combine to showcase a very nice, bright light. I have heard nothing but good things regarding Thumpback and I am excited to see how he plays. As much as I enjoyed Nintendo Week (and would still like to see it return for more casual news and gameplay etc), you can't beat the "directness" from Nintendo Direct. This is really what the end consumer wants and provides a means for the producer to zero-in on the target audience with direct news. Before I go off on some long and drawn out analysis on effective marketing, target audiences, and the like I suppose I should take from Nintendo and be more direct (plus it is 4 AM). (Sidenote, did anyone notice it is actually Wii U Direct, but everyone refers to it as Nintendo Direct from past precedence? Maybe they'll tailor each installment with a more accurate subtitle as in this instance and stick to "Nintendo Direct" for the official title and more comprehensive videos). If I get time I'lll come in and tailor my analysis...but for now, you can just watch Mr. Iwata yourself. Well, actually that was Nintendo's work, but hey...sharing is caring! The bottom line is simple...you need to watch this. As a Wii U owner this is HUGE. Hope everyone had a good day and is ready for the weekend. What Was Stock Like? I have STILL never seen LightCore Shroomboom anywhere in person. If not for Amazon's listing I would still be looking. Slogan: "He Shoots, He Spores!" LightCore Shroomboom has basically done a vanishing act since his release at Toys'R'Us. I have NEVER seen him in person at any store. If you do not want the Dragonfire Cannon Battle Pack this is a way for you to pick up Shroomboom and add him to your stable. Do not pay more than retail!! As for the light-up effect on this one, I think they did a nice job. Rather than yet another disappointment, I think the work done on Shroomboom suffices and casts a nice glow...the green mushroom really sets it off and pushes him over the edge. Overall, if you are a Shroomboom fan this is a no brainer. If you are a fan of LightCore characters this one is nicely done. What Was Stock Like? I have NEVER seen a Lightning Rod single pack locally. I saw his Triple Pack last Thursday and broke the news on that. Online he was available on Walmart.com for probably 10-14 days, but I held out thinking I'd find him locally. As of right now they've yet to restock and Amazon.com looks to be your best bet. Slogan: "One Strike and You're Out!" Series 2 Lightning Rod is proving to be tough to find at the moment. I think in a few weeks or as shipments hit and demand slows he should be "more" available. That said, while I was initially not impressed with his repose, once I had it in hand and unboxed I have to say it is very well done. The finite details are what set it apart from others and make it a true stand out compared to the Series 1 offering. The facial details is fantastic, the flowing (or static electrified) hair is a nice touch and the cuff bracelet details are top notch. Couple those qualities with better paint and you have the makings of a great repose! Now we just need to hope his WowPow is as impressive! What Was Stock Like? Pretty easy to find online. I suggest Amazon.com, GameStop.com, and Walmart.com. Locally I have only seen standard S2 Stealth Elf in single pack form once at TRU. Stealth Elf is a big time player in the Skylanders franchise and one, if not the quickest out of the entire cast of characters. Her repose is done quite well in that it showcases her Elven Sunblande and places her in a "motion" pose. She joins Legendary Stealth Elf in this go around. I would highly suggest you add Stealth Elf to your arsenal if you do not have her. She should be in any serious collection for the completionist, or casual player. What Was Stock Like? I've only seen one single pack in person at TRU. Online he is pretty easy to find and I would suggest Amazon.com, GameStop.com, or Walmart.com as your best bets. Eruptor's S2 pose is decent, but not one of the most impressive. He is also accompanied in the Giants lineup with his LightCore counterpart. It is currently tough for me to find him locally, but online he has readily been available. What Was Stock Like? I have yet to see S2 Prism Break locally, but online it hasn't been too hard to find him. I would suggest Amazon, Walmart, and GameStop. Slogan: "The Beam is Supreme!" I think with the offerings this time around more people are warming up to Prism Break, but much like Boomer far too many just cast him off without fully upgrading him etc. Maxed out Prism Break is a force to be reckoned with and excels in story mode...In the skillful hands of a great Portal Master he can be just as intimidating in Battle Mode. If you are just getting into Skylanders, or are just on a tight budget, I would suggest you pass up S1 Prism Break and LightCore Prism Break to focus in on the epicness that is Series 2 Prism Break! I'm partial to the original Wiimote, but I have fairly large hands. This iCon Wiimote and Nunchuck are affordable and come in a variety of colors to please most anyone. At roughly half the price of most offerings they are also a good deal. What Was Stock Like? Very limited! If you did not pre-order, I would not bank on getting this right away. Before you panic, I imagine the next shipment will come pretty soon and if you really want it, you shouldn't have much trouble landing it. That said, it might pay off to try and order it from GameStop.com or check with your local store to hold one etc. The catapult's ball-like projectile lights up from within and radiates an amber glow...much like the Golden Dragonfire Cannon. If I get a chance when someone is over I'll try to record some PvP at the new arenas. As is, it is hard for 1 person to do much worth watching there...I still say Giants should have had Single Player options in Battle Mode. Wow! This feels like an accomplishment since with Hot Dog, we finally have all of the new Skylanders available in their standard pose. I am excited to see him in action as his story was pretty good. I was very excited for Zap, but the voice on Skylanders.com is far from what I would have expected him to sound like...I am hoping that won't sway me in the game. Zap is someone I have really looked forward to as I will finally be able to try the other path as he was one of a small handful of Skylanders that had what looked like 2 great paths. If you did not pre-order I would monitor GameStop.com and check with your local store on the next delivery. For all we know it could come Monday of next week. That said, based on what I saw tonight I would not bank on picking the Scorpion Striker Battle Pack up this weekend if you did not pre-order. That said, this will only be a timed exclusive to GameStop so worse come to worse other outlets (Toys'R'Us, Walmart, and Target, etc) should have this Battle Pack in a few weeks. Good luck fellow Portal Masters! 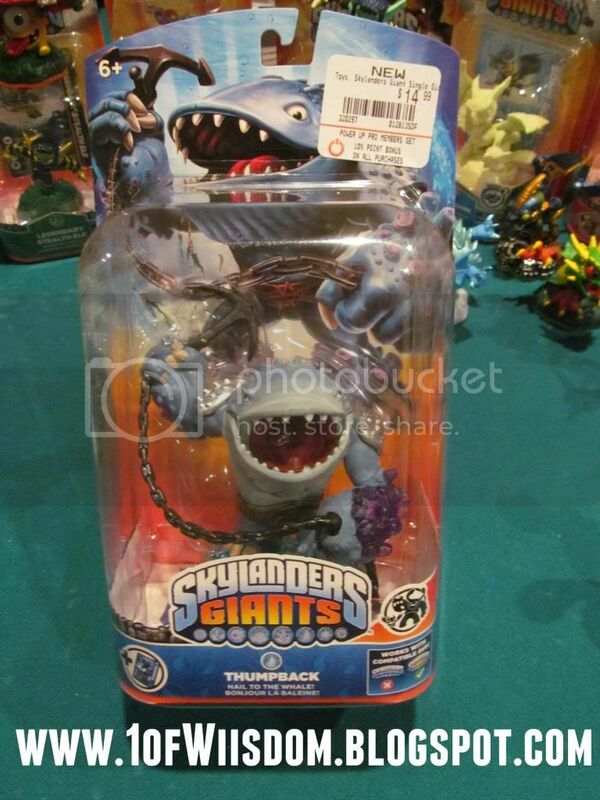 Skylanders Giants Triple Pack 5 and Triple Pack 6 Revealed! In addition to getting the Scorpion Striker Battle Pack with Series 2 Zap and newlander Hot Dog, I also saw first hand two new Triple Packs...conceivably Triple Pack #5 and Triple Pack #6. Granted, I am not sure which will be #5 and which will be #6 (or even if that will be their designations), but I can vouch for them and if not for just ordering S2 Prism Break and Eruptor last night on Amazon I would have picked up at least one of them...There is more to that story, but I digress. I will unbox this one as soon as the post is over...it should be live on YouTube within the hour. I will also postpone my plans to upload Chapter 10 and instead record Zap and Hot Dog's Heroic Challenges as well as what the Scorpion Striker adds to Battle Mode. Now is where things get tricky as we don't "officially" know the designations of these Triple Packs, but we do at least know they exist...and that is the important thing! I'll post them below and then simply swap pics and info when we have definitive word on their numbering. Yep...you're probably as shocked as I was, lol. We have S2 Eruptor, S2 Stealth Elf, and S2 Terrafin. Not the greatest Triple Pack ever, but still quite solid. Again, a nice pairing of 2 Wave 3 Skylanders (Prism Break and Lightning Rod), and Wave 2's Drill Sergeant. I really want Lightning Rod, but held off since I had just ordered S2 Prism Break from Amazon last night. Similarly, I don't really want a second Drill Sergeant. I was also tempted by the Eruptor and Stealth Elf offerings, but ultimately held out due to the fact I had just ordered S2 Eruptor from Amazon last night and the fact I already have L-Stealth Elf on the table. I really wouldn't have minded another S2 Terrafin, but I'm trying to be thrifty. If I can still cancel the Amazon order I may call tomorrow and then do so...I have still never seen Lightning Rod or Prism Break in single pack form locally...The only Wave 3 Skylander I saw tonight was Cynder...and I passed. There is also perhaps reason to hold out spending your hard earned cash at GameStop. I have had several sources tell me they could be the source for Giants Sidekicks (think Frito Lay's promo in SSA). Before you get too excited, it sounds like it could be a pretty interesting set up...I won't go into it much until we know more definitively. As always, I try to stick to what is known and certain, not just loosely derived from speculation etc. Nonetheless, there you go...BRAND NEW BREAKING INFO! I have yet to see this anywhere on the net and just checked GameStop.com to see if I could get a designation on which was 5 and which was 6, but they are still empty with no place holders. The other "big" news you probably wonder about is the Giants. I checked and my store did not get any...I was leaning more towards it being the middle of the month, so hopefully we get lucky there. I expect both Thumpback and Eye Brawl to be tough to track down, but I would love to be wrong. Well, I am off to unbox the Scorpion Striker Battle Pack! Hope everyone pre-ordered! For the time being, this will just be a log of my recorded "online" matches in Sonic & All Stars Racing Transformed for the Wii U. Below each installment you will find the description. This was my first time online (obviously) and we had a few issues finding the online match on the menu and then joining up in the lobby. Past that the only real issue was being unsure how to change tracks...I joined the lobby, and thus didn't have full control to explore, so I'll have to wait until the next online round to see if that will take care of it. We did learn that you can not be the same character. This was just the next round of recordings and it stopped after one race. What was Stock Like? Should be easy to obtain early on...I personally have always had trouble getting calendars if I don't do it in the first 2 weeks of the New Year, but that might just be me, lol. If it is in print long enough past that the price should drop at most outlets. This is a 16 month calendar, which honestly doesn't mean a whole lot if you are getting it now, lol. That said, for those that plan ahead and bought it early you got to get a little more of your hard earned cash out of the product. *Note: "Featured" refers to stand alone, top page art and "Secondary" refers to a cameo in the bottom right hand corner. This is a pretty cool calendar for any Skylander fan. The price is right at under $10 as well. My biggest gripe comes in the title. 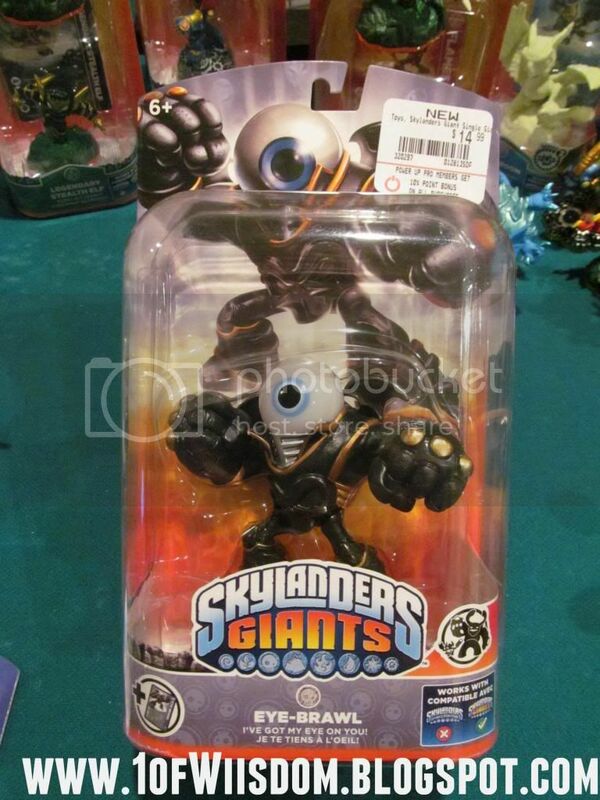 The calendar is dubbed "Skylanders Giants" an dthe cover features Tree Rex's ominous gaze. However, there are NO GIANTS and NO NEW SKYLANDERS featured in the calendar, or even highlighted! This is a bit misleading if you are buying it as a gift and are not "in the know" on all thing Skylanders. I don't think anyone would be too disappointed, but it certainly doesn't match what you would think having Tree Rex on the cover. An interesting note is that each featured character and secondary featured character appears in the game as a repose. The only two featured characters that do not appear as a repose are Ghost Roaster and Sunburn, both from Adventure Packs. My personal gripe, and a minor one at that, is that Darklight Crypt does not seem like it should be January. I would have put it with October for Halloween. To the designer's credit the Undead Element does occupy that turf, but Ghost Roaster just screams Halloween more to me than Cynder and Hex. I think that duo would have worked fine pretty much anywhere else, even in February as they are both girls. Again, minor complaint, but valid. I did like Empire of Ice getting December. Only other issue is that Slam Bam was with Gill Grunt in January...I personally like that, but since Slam Bam was already featured we could have had Zap in his place at the bottom...Terrafin was not featured at the bottom of Prism Break's month, but rather it was Bash. Anyway, all-in-all, this is a nice calendar that any fan will love. If you are buying it as a gift you might want to make sure the recipient isn't expect 12 pages of Tree Rex, Crusher, and Thumpback etc. Have fun counting down the days of 2013 with your Skylanders Giants Calendar! Where Did You Get It? Santa! Not really, but it was a Christmas present from my sister. What Was Stock Like? I have never had trouble finding S2 Flameslinger around my local stores. Slogan: "Let the Flames Begin!" Flameslinger is back with a very nice repose and ready to battle Kaos yet again. This repose is nice, but isn't much of a departure from his original SSA pose. The most obvioius addition is the crouch for the three-arrow volley shot. Nonetheless it is a good repose. In my dreams I would like to see a blaze behind him, but that probably wouldn't be durable. Anyway, Flameslinger is a nice addition to the arsenal thanks to his long range attacks and the incredible FlameDash based Supernova! The other big perk to Flameslinger is his speed...I recall him being much more agile than his Fire Element brethren. Eye Brawl and Thumpback in the Near Future! How about some REALLY awesome news to start 2013? Well, this should suffice. While skimming the net today I found 2 very good leads on the potential release of both Thumpback, the Water Element Giant, and Eye Brawl, the Undead Element Giant. However, when on GameStop.com I found the packaging proof had been added for BOTH Thumpback and Eye Brawl!! This is a big deal because that is what GameStop has done in the past before a new character was up for sale...You can also note that they have yet to add the Wave 3 Single Packs to that coveted list, so I am thinking it is imminent that we will see both Giants very soon. Checking around elsewhere, I turned up on Amazon link to Thumpback...with the packaging proof, yet another encouraging sign! Personally I am more excited for Eye Brawl, but I know the vast majority seems to want Thumpback. Stay tuned for updates and good luck landing the new Giants! *Update 1/2/13 5 AM (so much for getting to bed earlier in 2013): It looks like several sources are saying we will see Thumpback and Eye Brawl hit on the 9th and that we can expect Ninjini mid-to-late January. I obviously can not confirm this and would still call it speculation, but they have to come out some time, right?! I also want to point out that there remains a good chance we could see some straggling characters like Wrecking Ball or Spyro in their S2 repose hit the shelves. I will update again as new or confirmed info arrives. Updated 1/4/2013 to add Walmart Links.